The American Academy of Family Physicians (AAFP) honored John Frey, MD, a professor emeritus and former chair of the UW Department of Family Medicine and Community Health (DFMCH), with its prestigious John G. Walsh Award for Lifetime Contributions to Family Medicine. This award honors those individuals whose dedication and effective leadership has furthered the development of family medicine. It recognizes long-term dedication, rather than any single significant contribution, and effective leadership toward furthering the development of family medicine. This award is not granted on a regular basis, but is awarded at the discretion of the Board. Dr. Frey joined the DFMCH in 1993 as professor and chair, roles he held until 2006. He remains on the faculty as professor emeritus with interests in community health programs, community-based research, and medical journalism. 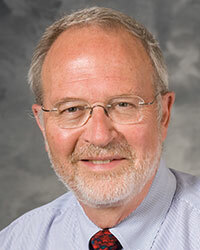 Dr. Frey served on numerous Society of Teachers of Family Medicine (STFM) and AAFP committees. He was an STFM board member from 1997 to 2000, and served as STFM president from 1998 to 1999. He also served on the literature selection review committee at the National Library of Medicine and on a training advisory committee at the U.S. Department of Health and Human Services. He was on the founding editorial board of Annals of Family Medicine and remains an associate editor. Dr. Frey has had 17 invited professorships, given 49 national and international presentations and led innumerable seminars and workshops. The award is named for the late Dr. John Walsh, who devoted his career to family medicine. He distinguished himself by becoming the first individual ever to hold the presidency of three major family medicine organizations: the AAFP, the American Board of Family Practice and the Family Health Foundation of America (now the AAFP Foundation). Congratulations, Dr. Frey, on this remarkable honor!